Knife companies all claim to have the "sharpest knives." The knife is not sharper in the other drawer, it's sharpest when you use the proper sharpening tools, like a wet stone. Chroma Type 301 knives were designed by Ferdinand "Butzi" Alexander Porsche, so yes, they're sharp, just like the next utensil. However, the difference was in their design. That was my challenge, to sell Chroma Type 301 knives to those who care about design aesthetics. They are professional and at-home chefs who care about what others think of them. They take pride in their possessions and will splurge on more expensive items to show off to friends and family. They also are car fans. Not the old classics, but supercars. Think, Koenigsegg, Bugatti, Ferrari and of course, Porsche. For professional chefs, only part of the show is the food. The real performance is watching them cook. 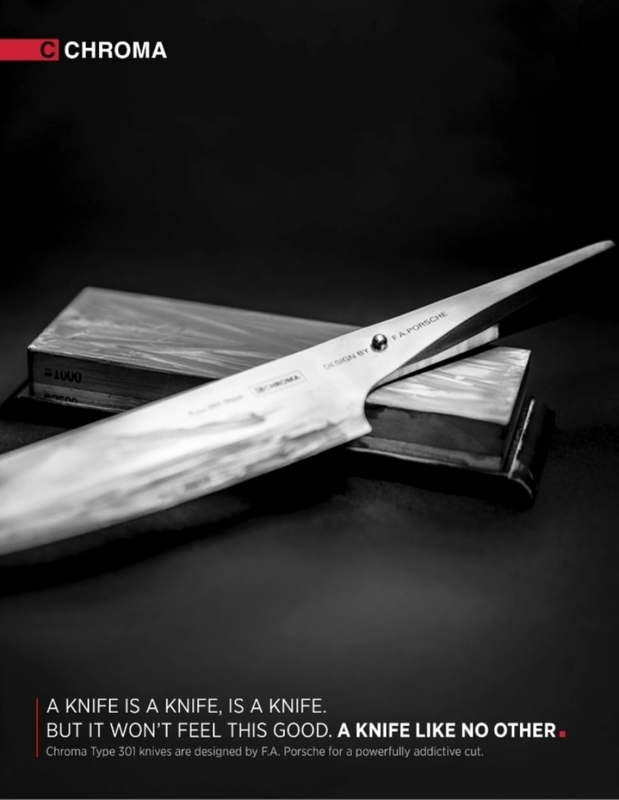 Chroma Type 301 knives are a status symbol for the chef. They are the accent pieces to his cooking performance. * This is work that I did while at SCAD.